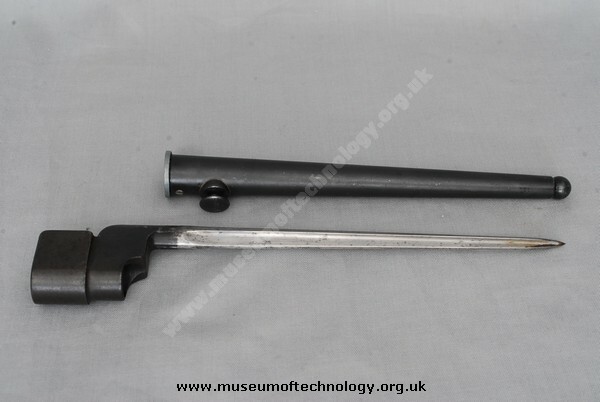 The original spike bayonet for the No 4 rifle, the cruciform shape was banned by the Geneva Convention and the Mk2 was introduced in 1940 with a plain round spike. Made by Singer Manufacturing 'SM'. Complete with Scabbard. From what I've researched, the Singer Manufacturing Co. in Clydebank, Scotland produced 75,000 of the No.4 MK. I spike bayonet with cruciform blade. I don't know about Geneva Convention. For example, France had cruciform blades. It was a complex shape to machine, so the series of Mark II, II* and III were evolved to ever simpler manufacturing standards.